If Brett Kavanaugh wins Senate confirmation to the U.S. Supreme Court, SeaWorld may have a friend in high places. In 2014, President Trump’s pick to replace Justice Anthony Kennedy sided with the Orlando-based theme park company in the case of a $70,000 OSHA fine involving the 2010 death of SeaWorld trainer Dawn Brancheau by the killer whale Tilikum. 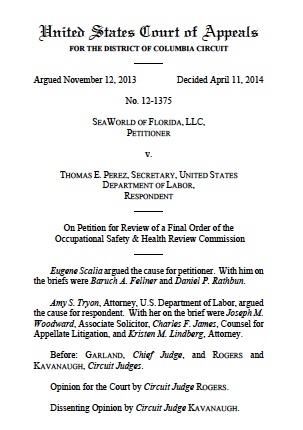 In her majority opinion, Rogers didn’t accept SeaWorld’s argument of a precedent in a San Diego case. Cal-OSHA hadn’t issued a citation for killer whale hazards after Kasatka bit and dragged a trainer underwater. The trainer, Ken Peters, suffered a fractured left foot in that 2006 incident at SeaWorld San Diego. In his 2,900-word dissent, Kavanaugh likened orca trainers to sports and entertainment figures involved in “extremely dangerous” events, including football, ice hockey and downhill skiing. He noted that such sports didn’t come under federal health and safety rules — and that trainers, such as athletes, willingly take risks. Kavanaugh also cited “bull riding at the rodeo. … Daredevil motorcycle jumps. … Cheerleading vaults. Boxing. The balance beam. The ironman triathlon. … (And) movie stunts” as activities not subject to OSHA regulations. Laws said the dissent warned that the SeaWorld case opened the door for Department of Labor regulation of the NFL, NHL and the like. On Tuesday, a blog post by Jordan Barab, the Obama-era deputy assistant secretary of labor at OSHA, quoted former OSHA Assistant Secretary David Michaels. According to a spokesman for People for the Ethical Treatment of Animals, or PETA, the SeaWorld case involving the OSHA fine cannot be appealed. “And we know of no pending cases at the Supreme Court that involve SeaWorld,” the spokesman, David Perle, said Tuesday. And none of the 10 pending SeaWorld cases in federal courts is likely to rise to the Supreme Court. SeaWorld did not immediately respond to a request for comment. 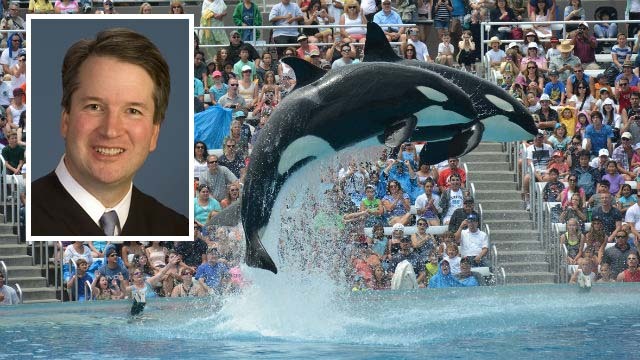 Besides Garland and Kavanaugh being involved in that appellate case, another Supreme Court connection was an attorney arguing on behalf of SeaWorld. “SeaWorld was represented by attorney Eugene Scalia, the son of late Supreme Court Justice Antonin Scalia,” noted an Orlando TV news report.